Puppet Bureau concerns itself with the publication of interesting books and other media from the people who brought you the amazing adventures of The Middleman! 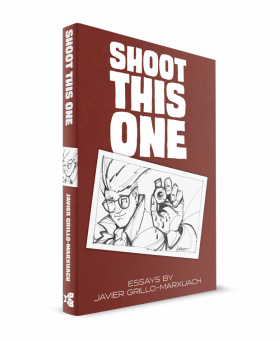 In this follow-up to his first collection of essays - Shoot This One - television writer and producer Javier Grillo-Marxuach continues to overshare about his misadventures in the small screen to a degree that will make you fear for his future employment. Including, for the first time in print, Grillo-Marxuach’s internet-breaking, no-holds-barred account of the creation of the hit show Lost, as well as the never-before-seen “mean version” of his essay “The Eleven Laws of Showrunning” - an incendiary assault on the toxic culture behind many TV series - the essays in Shoot That One offer both a tantalizing glimpse into the inner circles of the entertainment industry as well a management lesson disguised as a juicy tell-all. 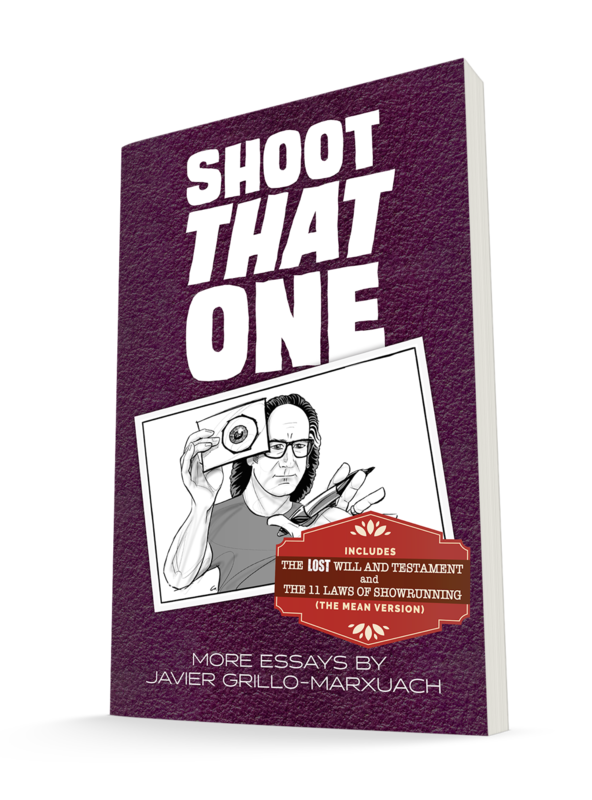 With Shoot This One already on the reading list in a number of writing courses, Shoot That One digs deeper not just into the workings of TV but also popular culture as a whole. Whether he’s taking a flamethrower to the rampant bigotry in show-biz, explaining why your junior high school English teacher was wrong about how stories should end, or arguing that some films are better experienced with earplugs, Grillo-Marxuach takes no prisoners, tells it like it is, and shares what he knows with career-threatening candor and an endless curiosity about the medium and its message. In the ranks of the Metro Police, no cop was tougher than Robbery Homicide Detective Tony Kane. Once the scourge of the city’s criminal underworld, Kane now finds himself riding out his last days on the job in the last place that will have him… the Metro Police's Animal Division. Busting wayward pets and their careless owners is no beat for the city’s meanest cop — and his cat-loving partner, Officer Sheila Donnelly, agrees — but when a routine incident of porcine assault and battery becomes a murder investigation, the only way to crack the case will be by combining the talents of city’s kindest and warmest animal cop with those of its hardest-boiled homicide detective! 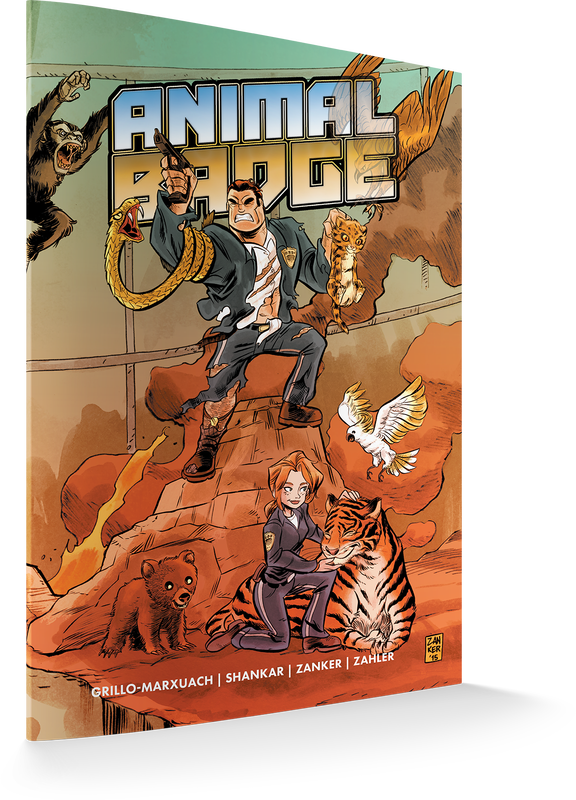 Written by Naren Shankar, writer/producer of CSI: Crime Scene Investigation, and Javier Grillo-Marxuach, creator of The Middleman comics and TV series - and illustrated by Armando Zanker - Animal Badge mixes swift justice and cute critters… and brings new meaning to the phrase “this time it’s paw-sonal”! "Don't be thinking that this is some sappy little Bible tract. This comic is a wonderful surprise and tackles what could be a tricky topic with a respectful but original approach. One of the things that makes this comic stand out from the rest (and why you should pick it up yourself) is the look of it. The artwork is stylized with watercolors which gives it a texture quite different than the overly slick digital art that has become the norm. Artist Steve Gendron designs the Heavenly Host to look grounded in a mythical reality – appearing human and clothed with armor and wielding swords delivering graphic and bloody wounds. Gendron tells Marxuach's story quite dramatically with his pacing and panel work." ﻿In God’s army, there is no warrior more fearsome than the Angel Ramiel – but when this enforcer of the Almighty is plagued by visions calling him away, he must make a decision that will shake the pillars of Heaven and Earth. COMPLETE FOR THE FIRST TIME - including the lost fourth issue! Puppet Bureau - by special arrangement with APE Entertainment - is proud to present the saga of Ramiel, renegade angel and mighty avenger, as it was meant to be seen: in a gorgeous large-format edition including all four original issues comprising the entire origin story of this brand new-hero ! When Ramiel first burst into the scene in 2012, he faced a nemesis far more pernicious than humanity's thirst for evil: the vicissitudes of independent comic book publishing! Now the story comes full circle in this long-promised, finally-delivered, trade paperback, including the never-before-seen final chapter! Would you like to know more about Ramiel - Wrath of God and check out some sample pages? Check out this story from USA Today! CONTENT WARNING - Rated R for graphic language, violence and adult situations. SELL ME THE WRATH OF GOD! "Javi is willing to open up the hood and tell you exactly how it's done... if it's your ambition to be a writer -- or any kind of storyteller, really -- reading this book will not just entertain you but spare you some heartache and headaches as you embark on this magical, heartbreaking, brain-melting path." How do you become a television writer? What does it take to create your own show? Did the writers of Lost really have a plan, or were they making it all up as they went? In a career spanning far longer than he cares to admit, Javier Grillo-Marxuach has not only written for some of your favorite (and not-so-favorite) shows — from the Emmy Award-winning Lost, and the Peabody Award-winning Boomtown, to Charmed, Medium, The Pretender, Jake 2.0, The Chronicle, and seaQuest — but also worked as a network executive, created a comic book that became a cult television series, co-hosted a popular podcast, and contributed essays to The Los Angeles Review of Books, io9 and Apex Magazine. Collected for the first time, Grillo-Marxuach’s dishy, far-too-revealing essays offer a true insider’s look into the good, the bad, and the bat-guano insane inner workings of the entertainment industry. If you have ever wondered how shows actually get on the air, how it feels to win an Emmy Award, and why a grown man would have to swear off watching Star Wars for an entire year, then this irreverent collection is not only the book you want, it’s also the book you need!